They are shown in the JMRI Preferences Connection pane as NCE, NCE via network, and NCE USB Interface, respectively. A very small number of early (pre-2002) NCE Power Pro (PowerHouse) command stations have an "optional analog control circuit". (If you don't recall special ordering this, you probably don't need to read the rest of this paragraph!) In these, pins 5, 6, and 9 are used with an analog voltage as a separate throttle. If you have one of these command stations, a normal 9-pin serial cable will not work! You'll need to make a custom cable that just connects the "send data", "receive data" and "ground" pins. See your NCE manual for details. The NCE "AIU" device allows the NCE command station to check the status of inputs from the layout. These are referenced in JMRI as "Sensors" with names like "NS785". "NS" means "NCE Sensor", and 785 is the number of a specific sensor input. JMRI can access accessory decoders as NCE Turnouts and Lights. They are addressed using the same numbers that you would use on your NCE throttle to throw the accessory decoder. For example, if you can access turnout 21 from your throttle, JMRI would address it as "NT21" or just "21". When you add an item to one of the tables, many times you only have to fill in the numbers to have JMRI construct the complete system name. The NCE Power Pro command station uses an "EPROM" to contain it's software. NCE has made several of these available to it's users. JMRI has been updated to work with these as they come out. To determine which ROM version you have, go to the 'setup command station' menu on the ProCab. The first screen will show you the EPROM version currently installed. December 2004 EPROM - JMRI 1.6.1 or any JMRI 1.7 version or later should work fine. 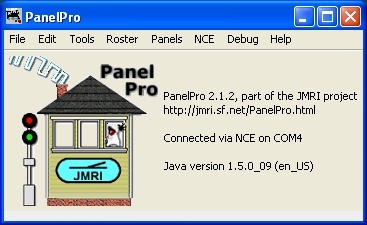 2007 EPROM - you need JMRI 1.7.6 or later. If you wish to use MONITORING for Turnout feedback, you must upgrade your Command Station to the Mar 1 2007A EPROM or newer. (For more information on turnout feedback, please see the feedback documentation page) The release in the first half of 2007 had a problem with odd turnout status. Every other odd accessory shared the same status bit. 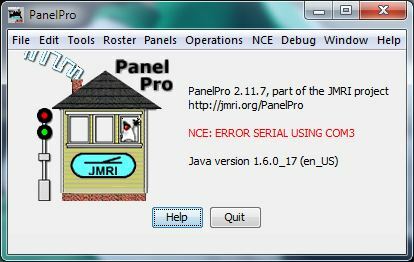 JMRI checks the revision number at startup, and will send a warning to the console window if it finds the early 2007 EPROM. If you're not sure if you have the latest, you can perform a simple test. First normal accessory 1 and 5 using the "Select Accy" button on your ProCab. Then using the "Select Accy" button, change accessory 1 to REV. Then check accessory 5, and if NOW = REV for accessory 5, you have the earlier revision with the known problem. If you have the early 2007 EPROM and wish to use MONITORING for feedback, contact NCE for an EPROM upgrade. This section discusses JMRI's support for connecting to the NCE Power Pro and PowerHouse via the serial cable connector on their front panel. To connect your computer to an NCE Power Pro or PowerHouse system, you can usually just connect the command station to the computer's serial port using a 9-pin serial cable. This cable must be a 'straight through' extension cable and not a 'modem' type cable. On newer computers there might not be a serial port, so you will need to use one of the computers USB ports and a USB to serial adapter. 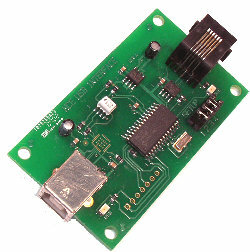 See Via a USB to Serial adapter for more information. Many USB-Serial devices will still need a serial extension cable to connect the command station to the USB-Serial adapter. Note that this is not the same thing as the NCE USB Interface, which is mostly for use with the PowerCab, not the Power Pro or Powerhouse system. Then go to the preferences panel of a JMRI-based program. This opens automatically the first time a program is run, or you can select it from the "Edit" menu. 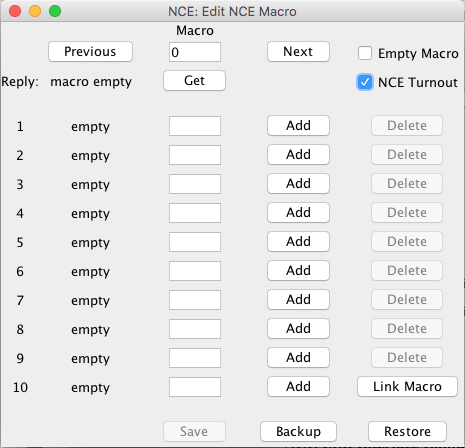 Select "NCE" from the top selection box. You can then select the proper serial port in the second selection box. If given the option to select a baud rate choose 9,600 which is the default for NCE. Now confirm that the AIU broadcasts are disabled and the baud rate set in the NCE command station is the same as JMRI. These are the normal defaults for NCE. Use a ProCab to select "SET CMD STATION" by pressing the PROG/ESC button 5 times. Then press the ENTER button 14 times to determine if AIU broadcasts are disabled. Press 0 to disable. Now press the ENTER button once more to select the baud rate. Press 1 to set the baud rate to 9,600, and press PROG/ESC to exit. Select the version of EPROM present in your command station, either "2004 or earlier" or "2006 or later". See below for more information on this. If not see the Troubleshooting section below. For reliable operation, we recommend that you disable "AIU broadcast", and set the baud rate to 9,600. These are the normal defaults for NCE. Both of these parameters can be found in your NCE user's manual under "Setup Command Station". Instead of connecting a serial cable from your computer to a Power Pro, you can also connect JMRI to your Power Pro via a network connection and a serial-network adapter. This will let you, for example, connect a computer in one room to a layout in another without having to run a long serial cable. Connect your serial-network adapter to your NCE Power Pro or PowerHouse system using a 9-pin serial cable. 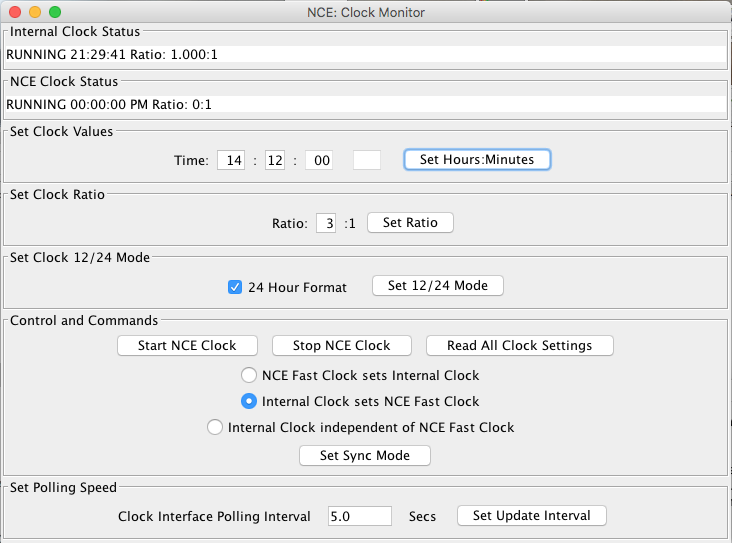 Configure the serial-network adapter to use the same baud rate set as the NCE command station. 9600 baud is the normal default for NCE. To confirm this and the AIU broadcast setting, use a ProCab to select "SET CMD STATION" by pressing the PROG/ESC button 5 times. Then press the ENTER button 14 times to determine if AIU broadcasts are disabled. Press 0 to disable. Now press the ENTER button once more to select the baud rate. Press 1 to set the baud rate to 9,600, and press PROG/ESC to exit. Select "NCE via network" from the top selection box. In the "Server hostname" box, enter the Internet name or Internet address numbers for your serial-network adapter. In the "Port number" box, enter the port on the serial-network adapter to be used. Select the version of EPROM present in your command station, either "2004 or earlier" or "2006 or later". See above for more information on this. If not see the trouble shooting section below. The NCE USB Interface can be connected to all NCE systems, Power Cab, SB3 (SmartBooster), SB5, Twin or Power Pro. You must select the correct system from the preference menu for reliable operation. On most computers, you'll need to install a driver for the CP201x USB to UART Bridge VCP used in the NCE USB Interface. If one of the above links doesn't work, you can perhaps find the needed driver on the support web site for SiLabs chips. Download the proper file, unpack it, and execute the installer. Be sure to follow the directions: On some computers, it matters whether or not the NCE USB Interface is connected and powered on when you do the install. Now go to the preferences panel of a JMRI-based program. This opens automatically the first time a program is run, or you can select it from the "Edit" menu. 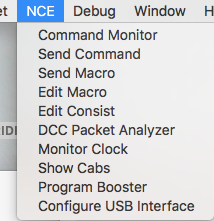 Select "NCE USB" from the top selection box. You can then select the proper serial port in the second selection box. Select the type of system that you are connecting the USB adapter to, Power Cab, SB3, or Power Pro (PowerHouse). The default is Power Cab, no jumpers installed. Now confirm that the adapter's baud rate is also set for 9,600 by removing jumper #1. Installing jumper #1 sets the baud rate to 19,200. The series of radio buttons labeled "GUI style" allows you to select how the program will look. "Metal" is the native Java look available on all types. Other choices will vary with your computer type. "CDE/Motif", "Windows", and "Mac OS X" look native on Linux, Windows, and Mac OS X respectively. In the bottom selection box, you can pick the default programmer format. You can override this each time you open the programmer, so this is here just for convenience. To connect your computer using a NCE USB Interface, you will need in addition to the USB Adapter, a USB A to USB B cable to connect the Adapter to your computer and a Throttle cable to connect the adapter to your NCE system. The Throttle cable may be another of the 'coily cords' that came with another hardware throttle or the PowerCab system. It is important to use a straight through RJ11 cable and not a crossover like some phone cables. Look at the end connectors to make sure that the colors are in the same order. You can use a RJ12 cable with six conductors in place of the RJ11 because it's only the four center conductors that are used, but it must also be a straight through cable. NOTE: If using a PowerCab, you must have firmware version 1.28c or later installed on that. Once the PowerCab is up and working, then plug the USB cable into the computer. The NCE USB Interface doesn't support all of the current JMRI features and functions. Some of the restrictions are based on the type of system the USB Adapter is connected to. The USB version 6. * can't get information from AIUs, so they can't be used to get feedback from the layout. The USB 7. * version when connected to a system with the 1.65 or higher firmware (PowerCab, SB5, Twin) the AIU cards can be used, but with restricted cab numbers as in the system manual. The turnout feedback mode MONITORING isn't available when using a USB, and the Clock functions found in tools are also not available. The USB when connected to a Power Pro system doesn't support any type of loco programming, and when connected to a SB3 only operation mode (no program track) is available for loco programming. Most functions and features that are not supported by the NCE USB Interface are disabled or grayed out in the JMRI program. No Turnout MONITORING, No Clock functions. No Ops Mode Signal (Extended Accessory) programming. No programming track support, Ops Mode programming only. No programming of any kind. USB below 7. * version, no AIU support. USB version 7. * and above, system with version 1.65 and above firmware, AIU supported. If your are using JMRI v 2.1.2 or newer and the screen looks like the above, congratulations; you are up and running. The startup screen for DecoderPro is similar to PanelPro's. Confirm that your NCE Command Station is powered up. Check your cables, make sure they are installed correctly. If there was more than one "Serial Port" to choose from in the JMRI preferences menu, try the others. Recheck the baud rates selected, make sure both JMRI and the NCE Command Station are set to the same rates. If you are having problems, you should try the JMRI users group to contact other JMRI users that can help you out.